When will be updated to FALL CREATOS AKA RS3? I literally created an account here just to thank you for these themes. It not only solved my issues with Win 10 explorer, but also my issue with CoreTemp (too bright in a dark room). When will be updated to FALL CREATORS AKA RS3? it's doesn't need to be. pleases make sure before attempting to run to install startisback, oldnewexplorer, and uxthemepastcher 3.3.1. Last edited by Hadden; 10-28-2017 at 01:27 PM. 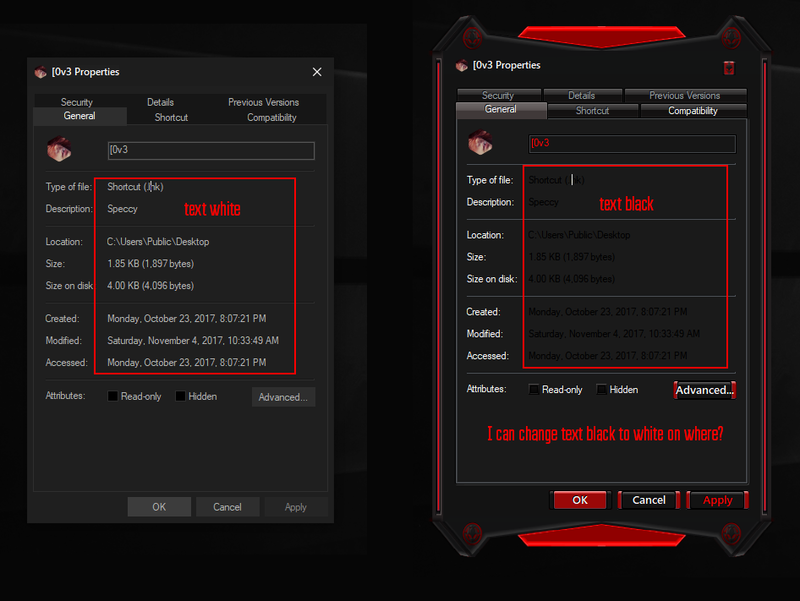 When I use your theme, text on Properties is white but on my theme ailen dark red mod text on properties is black. I can change text black to white on where? please help me. Thanks!